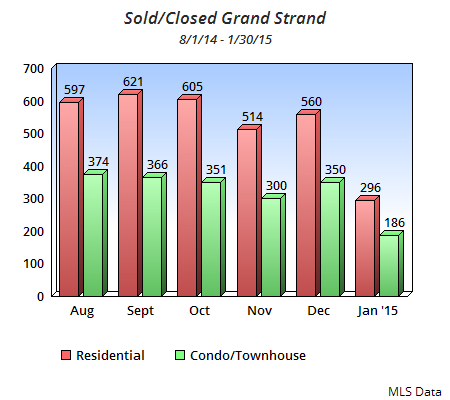 The Graphs below should tell you a story of a consistent market along the Grand Strand. The Closed properties, in both segments, had a very flat final 5 months of 2014. As you see, the start of 2015 didn't quite come in like a lion as many predicted. The fall off in sales volume is consistent here with the national stats as existing home sales declined 4.9% in January. The better news is that the price that properties are selling for has continued on a flat projection even with the selling volume decline. 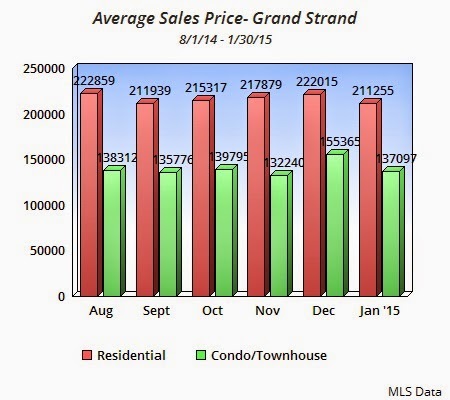 The Average selling price of Condos & Homes along the Grand Strand has not varied by much over the past 2-3 years. There has been some increase in single family pricing due to the high percent of New Homes selling over existing homes on the market. New Homes on average sell for about 3% - 5% more than a similar home that is existing. The most significant improvement in the real estate market over the past year has been the decline of Distressed properties available. Right now there are 4300 single family homes on the market with only 191 of them in a distress state - less than 1%. For condos and townhomes the number is equally low with 3386 available and only 99 distressed. The Foreclosure & Short Sale impact on value is behind us now on the Grand Strand. The reduction of these Foreclosures has aided in the improvement of the Median pricing, especially for homes. The good news is Interest Rates remain very attractive, local lenders have great programs for properties here including condo-tel designated villas, and the selection of great properties keeps a high level of qualified Buyers in the market. The market is a good market for both sides of a transaction especially if you have successfully moved past 2006 & 2007 as being your benchmark of a good market. In the world of Graphs if you were to track pricing here for the last 15-20 years the average pricing is currently the same as the Fall of 2003. Bear in mind that pricing has been about the same since the Spring of 2012 when it stopped going down. The reality is we are in a robust market with good demand and equally good supply. The balance in the market, in addition to, great interest rates and a steady stream of transplants leaving the Northeastern US for warmer weather, will keep our market stable and consistent through the next several years. We should continue to see New Construction of single family homes help support pricing in this segment, but Condo pricing won't have anything to help pull it up as New Construction in this segment remains years away. If you enjoy detailed market information and would like to read some of the data that I consume daily just send me an email with the request. We want you to be as informed about the market where you own property as you are about the balance in your 401k. Whether you are looking to buy or sell a property soon or not for a very long time spending a few minutes a month to be better informed certainly is worth the investment. Is it aggressive or UNethical? In my line of work I have the opportunity to speak with a lot of property owners each day. During the conversations I will typically hear about how many real estate agents have called and it seems a little overwhelming to them. If a property has been on the market and it failed to sell the information is sent out to a multitude of agents in the market that have an interest in helping get it sold, hence the calls. As a Realtor in the real estate field we are under a code of ethics sworn by our membership into the National Association of Realtors. 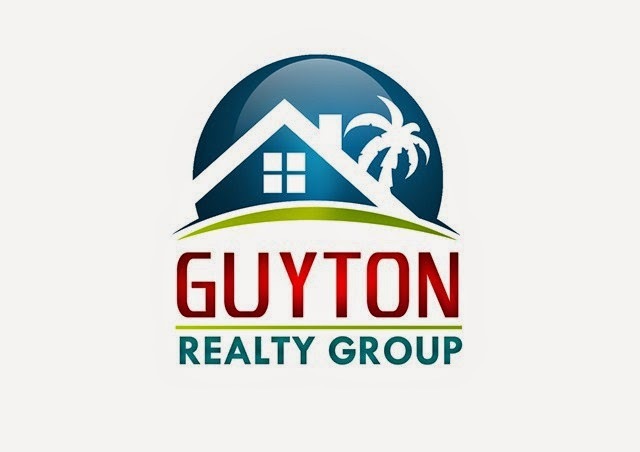 There is very specific language in the code the prohibits any Realtor from contacting you while you are a CLIENT of another real estate agent. This means that if your home is listed, under a listing agreement, with one real estate agent any other real estate agent cannot contact you to discuss listing your property. As the owner of the property you obviously have the right to speak with whomever you want as ling as you make the call to the agent. The reason Sellers receive so many calls in the days after a property goes off the market is because the agreement is over and the Seller is no longer a CLIENT of the agent. Other agents now know that the Seller has an interest in selling and therefore makes the call. The issue is the calls you receive BEFORE your listing expires. These are the real estate agents that choose not to abide by the code of ethics and try to circumvent a relationship you have established with your current Realtor. Beware of confusing aggression with an unethical behavior. The agent that calls to talk with you about your listing when it is still listing should be the last person you would want to trust your property with to get it sold. 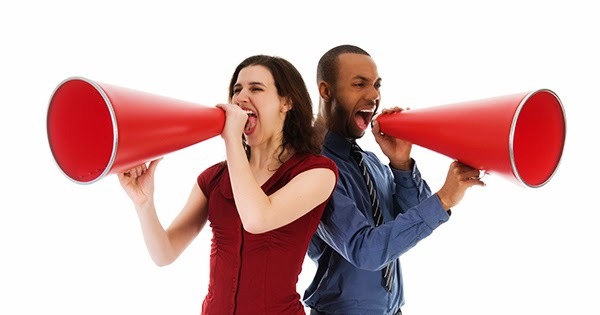 I would encourage you to reach out to the Coastal Carolina Association of Realtors to file a complaint if you receive a direct call from any agent when your property is listed and they continue to talk about your listing with you after you inform them that it is currently listed. For the best process in identifying the best agents out there shoot me an email and I will gladly share a proven strategy you should use to eliminate the rest and pick from the best.